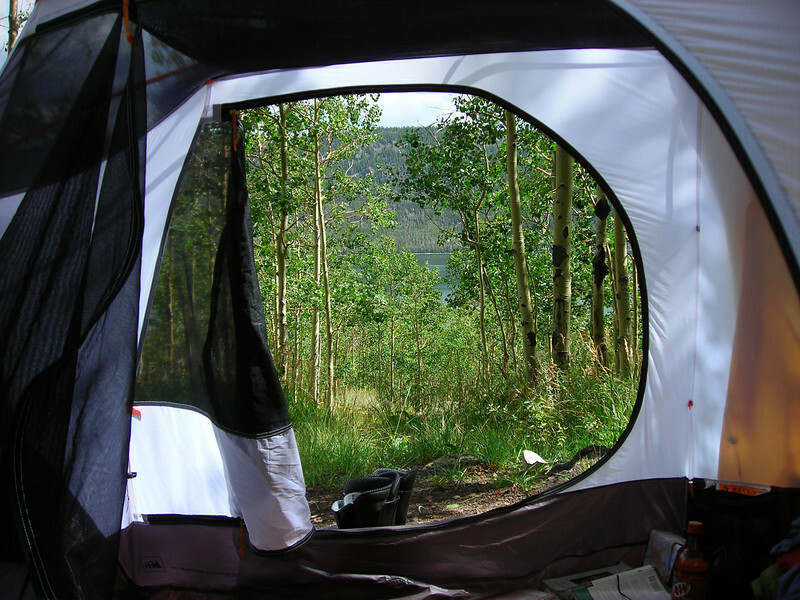 Grand Mesa camp grounds: It was looking at first like there weren’t any camps spots available. We get to the very last two sites. They were open. With both sites you have to walk up a steep hill to get to your tent. We for sure had the best spot in the place, closest to a clear blue lake with fishing and hiking trails. Today was devoted to hiking. There are trailheads all over this area. The signs claim lakes and photo opportunities. Sounds good. We pack some trail mix and a jug of water. We are off. The first trail is well groomed and maintained and circles around several small mountain lakes. After about an hour the trail doubled back to where we started. We remember seeing some more primitive trails on the way to this trailhead. We start hiking. Woods, lakes, swamps, springs, open grass savannas. This place has it all. Heidi keeps following. This is good. We merge onto another more defined but difficult terrain trail. We meet several mountains bikers. It had to be a hell of a ride for them, some had full face helmets. A great day of hiking ended with a big camp fire. This place has unlimited fire wood. It’s been raining steady since last night. A few days ago in Rock Springs we heard on the radio Hurricane Dean is going to bring rain all day on Monday. We made plans accordingly. The plan is to hunker down in the tent, read, play games, eat and just chill out. The rain stopped just long enough to make coffee and grab our corn muffins. It’s a challenge to be comfortable hanging out in a tent all day. We got several reprieves from the rain and were able to walk around and stretch but most of the day spent was inside. It’s not as warm here as hoped. In fact it’s been surprisingly cold all day. We are looking forward to going down from the mountains tomorrow and warming up. Heidi is starting to go nutty. She wants a bath & _ _ _…..